The Los Angeles County Museum of Art (LACMA) is considered the largest encyclopedic art museum in the western United States. Its collections, which include over 100,000 pieces, encompass the history of art from ancient times to the present, and from all corners of the world. Hours: Mon, Tue, Thu 11 - 5 pm, Fri 11 am - 8 pm, Sat-Sun 10 am - 7 pm. Closed Wednesdays, Thanksgiving Day and Christmas. General Admission: Adults $15, Seniors (65+) and students 18+ with ID $10, 17 and under Free (and by joining LACMA NextGen online, they can bring one free adult). There may be additional fees for some special exhibits and programs. Free Admission Days: Free for all on the 2nd Tuesday of each month and select Holiday Mondays. LA County Residents get in free weekdays after 3 pm. Parking: $16 in the parking structure on 6th Street just east of Fairfax (free entering after 7 pm). Additional parking is available at the Petersen Automotive Museum and Page Museum at the LA Brea Tar Pits. Metered parking is available on surrounding streets with some restrictions. Look for posted hours and time limits. More parking options near LACMA. Bonus: Free wireless internet from LACMA West through the Plaza Cafe. LACMA has gone through a variety of transitions since it was first established with borrowed art as part of the Los Angeles Museum of History, Science and Art in Exposition Park. The current museum opened in 1965 in Hancock Park on Museum Row on the Miracle Mile next to the famous La Brea Tar Pits. By 1992, the original three buildings had expanded to six, including the acquisition of the former May Company department store on the corner of Wilshire and Fairfax, which became LACMA West. That building has since been transferred to the Academy of Motion Picture Arts and Sciences for the new Academy Museum, scheduled to open in 2019. LACMA is in the midst of a major transformation project. Phase I added the Broad Contemporary Art Museum, the Entrance Pavilion and the parking structure, opened in early 2008. The first part of Phase II, the Lynda and Stewart Resnick Pavilion, opened in September 2010. Ray's farm to table restaurant and Stark Bar opened in 2011. Plans are in effect to replace the four original buildings of the east campus with a single new, earthquake-stable, solar-powered structure with more art-viewing areas. LACMA has a wonderful collection of art from around the world, but just like when traveling the world, you can sometimes get lost along the way. The maps available at the museum only show where the buildings are. They don't show the gallery layout inside the buildings. I found myself retracing my steps trying to find my way. Fortunately, there are plenty of security personnel around to point you in the right direction. The Grand Entrance to the Los Angeles County Museum of Art is in a walk-through open area accessible off Wilshire Boulevard immediately behind the Urban Light installation of light posts on the sidewalk, or from the parking garage elevator or Hancock Park on the other side. Ray's and Stark's Bar are adjacent to the ticket booth in the Grand Entrance. On the east side of the campus, The Ahmanson Building and Hammer Building are connected to each other to form a right angle. Gallery corridors flow freely from one building to the next, so you may enter one building and exit the other. There is also a bridge from the second floor of the Hammer Building to the Art of the Americas Building, formerly the Modern and Contemporary Art Building. The Pavilion for Japanese Art is a striking structure east of the Hammer Building with a separate entrance. It was very dark when I visited in the evening, but I imagine that with its translucent walls, it would be very well-lit by day. The Bing Center is a stand-alone building housing several auditoriums and a café. West of the entry plaza, The Broad Contemporary Art Museum (B CAM) is a modern building housing the contemporary art collection on Wilshire, and the Resnick Pavilion, LACMA's latest addition, is a 45,000 square foot single story exhibit building behind BCAM. The former May Company building at the corner of Wilshire and Fairfax is currently being transformed into the Academy Museum. During the ongoing transformation period, some collections will not be available to view. Check the website for up-to-date information. 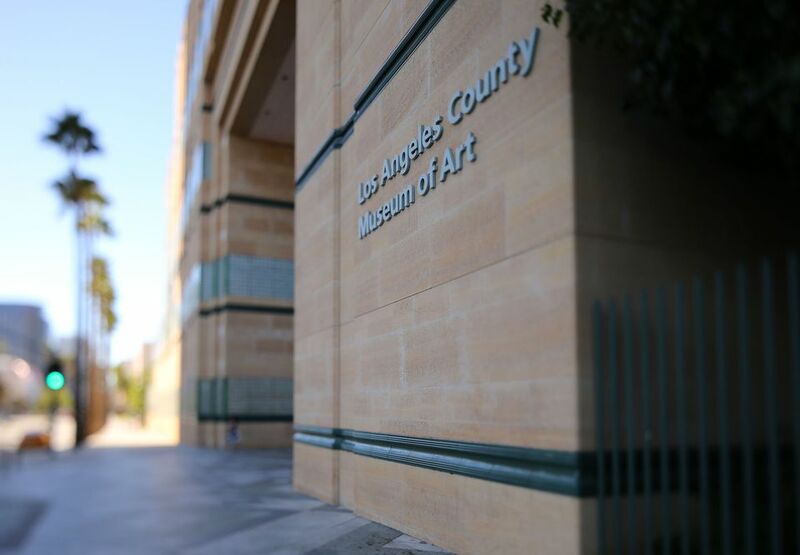 The Los Angeles County Museum of Art has over 100,000 works of art in twenty-one different collections. The Broad (pronounced Brode) Contemporary Art Museum (BCAM) opened at LACMA in February 2008 with the support of philanthropists Eli and Edythe Broad, who then went on to build their own independent contemporary art museum, The Broad in Downtown LA. Most of the first floor holds a set of massive walk-through sculptures by Richard Serra (above). The museum opened with a full floor of selections from the Broad's personal collection of contemporary art, which has since moved to the new Broad museum downtown, making room for additional temporary contemporary art exhibits. The Lynda and Stewart Resnick Exhibition Pavilion opened behind the Broad Contemporary building in 2010. The single-story building is designed by Pritzker Prize-winning architect Renzo Piano. The structure houses 45,000 square feet of naturally lit exhibit area divided into three sections. The exterior of the Resnick Pavilion is an acquired taste, but the light inside, created with dozens of rows of vertical, north-facing skylights, is amazing. You enter into a huge open gallery that crosses the length of the building and forms a T with branches at the north end of the building. Through doors to the right is another large space which can be configured for various temporary exhibits. Chris Burden's Urban Light installed on the sidewalk in front of LACMA has been one of LA's favorite and most photographed landmarks since its unveiling in February 2008. The piece incorporates 202 antique street lights from cities and neighborhoods in and around Los Angeles. Levitated Mass is a 340-ton granite rock perched across a wide 456-foot-long trough that allows you to walk underneath it. It was conceived by artist Michael Heizer in 1969 and originally attempted with a 120-ton boulder in a Nevada dry lake bed, but at the time, the equipment wasn't available to load a rock that size. The 340-ton boulder that now resides at LACMA fell off a quarry wall in Riverside County during a detonation. It took 11 nights to haul it along a specially designated route through four counties to its current home. According to LACMA, "Taken whole, Levitated Mass speaks to the expanse of art history — from ancient traditions of creating artworks from megalithic rock, to modern forms of abstract geometries and cutting-edge feats of engineering, as well as the modern philosophies underlying Heizer’s work of using negative space and volume as “physical” or measurable entities in major proportions in his sculptures and paintings." LACMA has a variety of programs to complement their art offerings. Education Department: art lectures, symposia and artist talks. Department of Music Programs: over 100 concerts a year including classical, jazz, Latin and new music. Friday Night Jazz and Sundays Live classical concerts are regular series. Art: studio art classes for kids and adults, art history classes for adults. Classes sell out. LACMA docents have a whole variety of ways to talk to you about art. You can hear a 15-minute presentation on one particular piece, take a themed 50-minute tour of the permanent collection or participate in an "Art Chat" about a special exhibition. The themes change daily, so check the calendar for the date you plan to visit. You can also schedule a customized tour at your convenience through Quick Culture art appreciation tours. The Boone Children's Gallery in the Hammer Building is always free to children and adults, with hands-on activities related to different aspects of the museum's collection. Story Time for young children is held in the Korean galleries next to the Boone Children's Gallery Mondays and Fridays at 2 pm. The rest of LACMA is always free for children 17 and under, but kids who join LACMA's free NextGen program have access to additional benefits. The best one is that they can bring one adult to the museum with them for free. Kids don't have to live in LA to be members. You can print out and mail in the application from the website or take it with you when you go. Members receive a Family Guide to the museum, with tips on how to talk to your kids about several different pieces in the permanent collection. Members can check out an Art Tote with more fun tools to help kids understand the art they see. There's also a free children's audio tour with stories about particular pieces of art. Family Sundays offer special children's programming from 12:30 to 3:30 pm nearly every week, with family tours and activities coordinated with special exhibits. There are also a variety of art classes available for children, teens, families, and adults. If you'd like to take your family on a guided museum tour specially designed for kids and it's not a Family Sunday, you can book a private Quick Culture for Kids tour. There are three dining options at LACMA all operated by the Patina Group. Ray's and Stark Bar in the Grand Entrance is the fine dining option with indoor and outdoor dining, farm to table cuisine and a full bar. They are open from 11:30 am – 8 pm Monday, Tuesday and Thursday, 11:30 am - 10 pm Friday, and 10 am to 8 pm on Saturday and Sunday. Happy hour is Monday through Friday 3–6 pm. Reservations are recommended and must be made at least a day in advance. LACMA Café in the Bing Center is a more casual restaurant with sandwiches, a seasonal salad bar, baked goods, and hot options with seating indoors and outdoors. C+M (Coffee and Milk) in the Central Court has gourmet coffee drinks, baked goods, and savory sandwiches.